Shantell Martin is a huge role model for me and I’ve been meaning to write about her for a while. Her work is simple, minimalist and honest. She is very prolific as an artist and describes her work with the hashtag #DrawOnEverything; which has hugely inspired my latest creative direction. She has made her mark on walls, clothes, bicycles and even planes, and collaborated with amazing brands such as Vitra, Nike and Vespa. Her philosophy is as simple yet striking as her distinctive drawing style. Iterations of the question “Are You You?” can be found again and again throughout her work, reminding herself and us to always stay true to who you are; to be yourself. I was extremely lucky to have the opportunity to ask her a few questions regarding the business side of her work and creative life in general. I wanted to share some of her insights, as many of my followers are creative people and might find her perspective helpful. 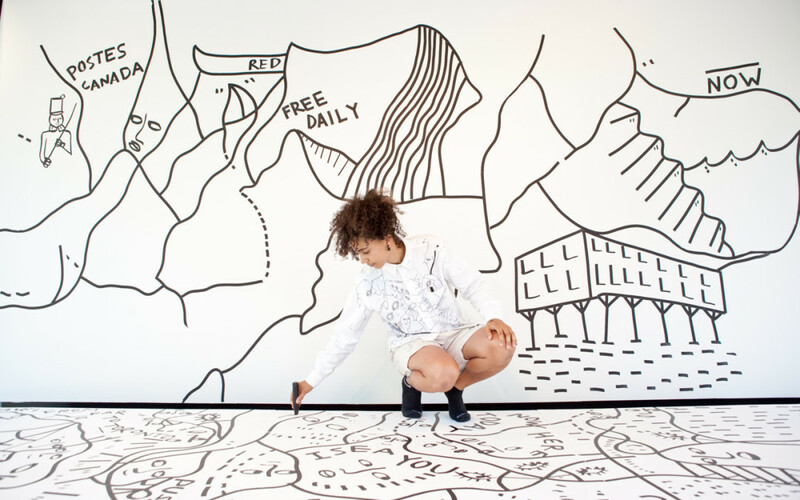 I hope you will enjoy learning about Shantell’s work as much as I have. A: If you were just starting out with your work of commissions and collaborations in a new city today, what would be your fist step? S: Most likely I would continue to do commissions and collaborations in the city/s I just came from, while slowly getting familiar with my new surroundings. It takes time for you to get used to a new place and to build your presence. A: Since moving to New York and starting your #drawoneverything practice – what are the three greatest challenges you have faced? What are the major 3 lessons you have learnt? S: They all found me. Its kind of hard trying to convince people they should work with you or their company should hire you. Its much better to focus on what you love doing as an artist and having people see that and want to be a part of it. A: What do you say no to? S: Anything that’s not a good fit. I keep a track of all the asks that come in. For every yes I have said no to at least 20 other projects. A: How much input do you take from a client regarding the final outcome of the work? S: A client may give me a list of key words or images to consider when creating the work, but I do not guarantee that all or any of these will end up in the final piece. A: Have you had a negative experience with a client and how did you resolve it? S: Sure, in more than one occasion a client will brake the terms that we have agreed to in a contract. They will try and use my work outside of the scope of the project, try and keep work we agreed would be destroyed, add on lots of extras when a project starts. You just have to be very professional and follow up with your lawyer if needs be. A: Have you ever done artwork for free or in exchange for goods/services? S: I’ve defiantly bartered in the past and still do now and then as long as there is some kind of exchange to show your value. The work I’ve created or donated for free has been for charities and non-profits, but in a way I get to feel good and that, so an getting something back in return. A: Your work, especially the wall drawing, is quite unique – how did you first figure out the value of your art and the pricing for your commissions? S: Slowly but surely. You start somewhere and grow those numbers as you grow. A: How strict are you regarding your style and subject matter and have you ever done work that doesn’t feel fun/fulfilling/challenging but was a good source of income? S: No…But that may happen in the future, lets see. A: Do you have any methods or practices to make sure your work is true to yourself, to be You? S: Yes, I put my self in situations where I do not have time to plan or think too much about what I’m doing, so what comes out is very free and me. A: How do you prepare before creating a new large piece? Do you ever have ‘creative blocks’ where you don’t have a clue of what to make? S: For a large piece I’ll find myself pacing up and down in front of the wall before hand, I think this is a way that my mind subconsciously measures the space. As soon as you start the lines flow and brake any blockages. A: What are your rituals – things you do daily; or things you do to get into the zone for creative work? S: Humm, not sure. Water, good music. 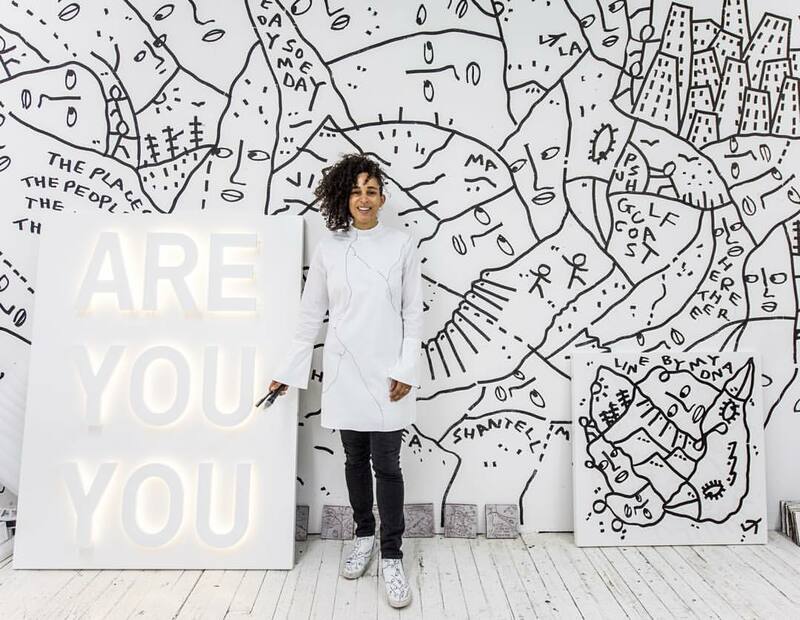 For more information about Shantell and her work you can visit her website, read this interview and watch this video.